One of the things we enjoy most about social media is connecting with people from coast to coast. On the home front, we’re tickled when we see our collections come to life – especially during family time. So, when a blissed-out bathtime photo from a mom in Maryland showed up on our Instagram feed, it made our day. Little did we know that Melissa Renno was on a first name basis with the sales team at our Jessup showroom. In the midst of all things renovation, she gave us the scoop on how she’s reimagining the dream home she bought with her husband Ryan last year. She’s on a juice cleanse the first time we talk. But it’s not her superfood diet that’s impressive. It’s clear from the get-go, Melissa knows what she wants. After purchasing their storybook house twenty miles north of Baltimore, she spent a good part of 2018 customizing the 3,500 square-foot home to suit their busy lifestyle. 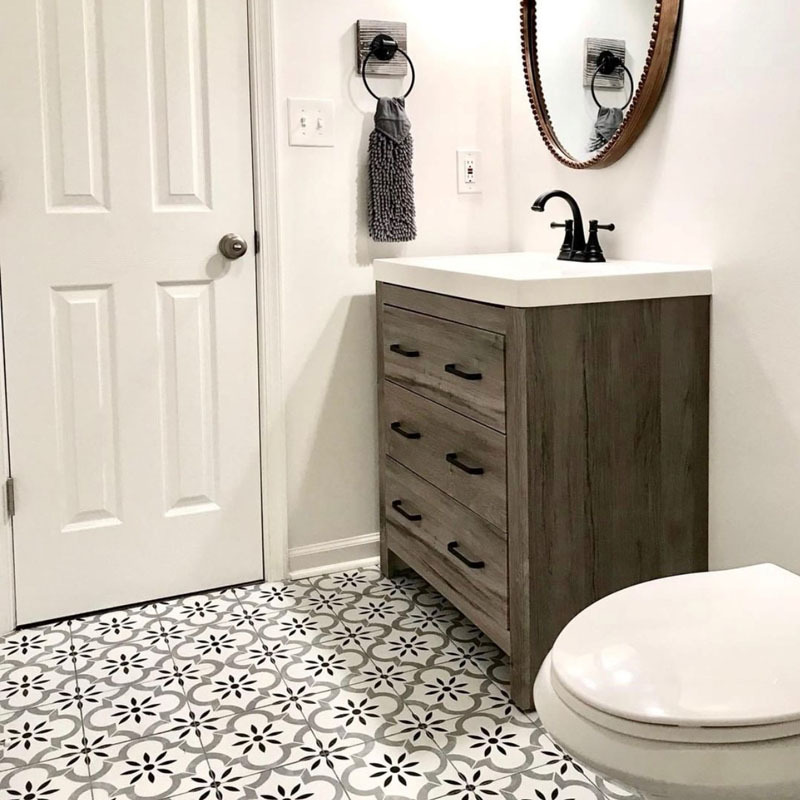 A pared-down color scheme, like the black and white palette the Renno’s chose for their master bath—is easy to design around. Featured: Kenzzi Kasbah tile. The Renno’s minimalistic, clutter-free aesthetic became even more pronounced when their sons arrived. The pair adopted Gideon (age 7.5) and Bishop (age 6) from China. “I rely on interior design more than most to promote a sense of calm and well-being in our home. Roller coaster days are the norm, so we’re always on the lookout for things that are good for everyone’s body and soul,” said Melissa. 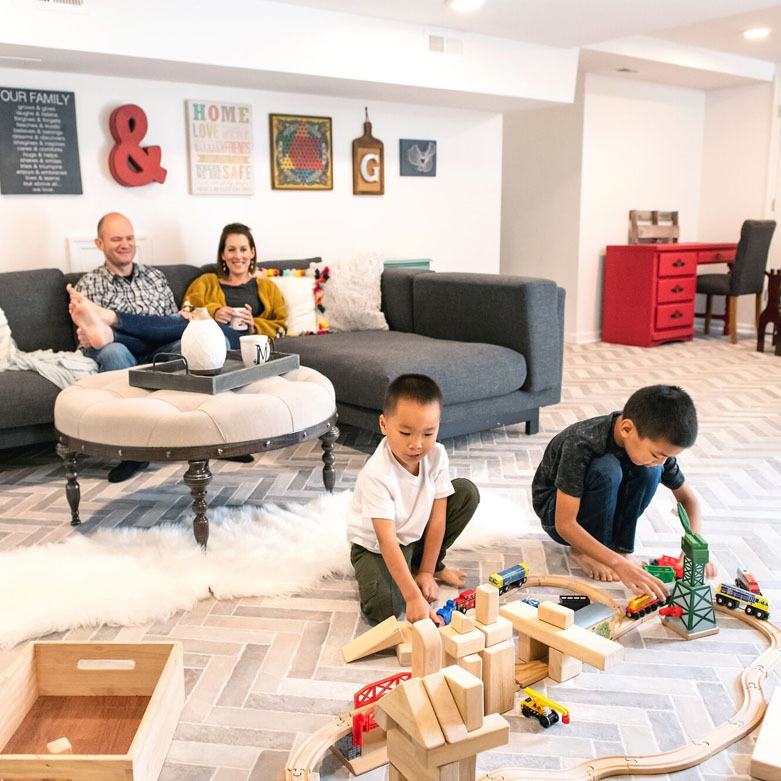 Because the couple work from home full-time (she’s running a business as a Young Living Diamond Leader and Educator, he’s a software engineer), there’s even more incentive to create a haven that’s inspired and unfussy. Cutest family ever: Ryan, Bishop, Melissa, and Gideon. Along with serene colors, soft textures, and a less-is-more philosophy, the self-professed homebody likes modern design that’s ultra cozy. 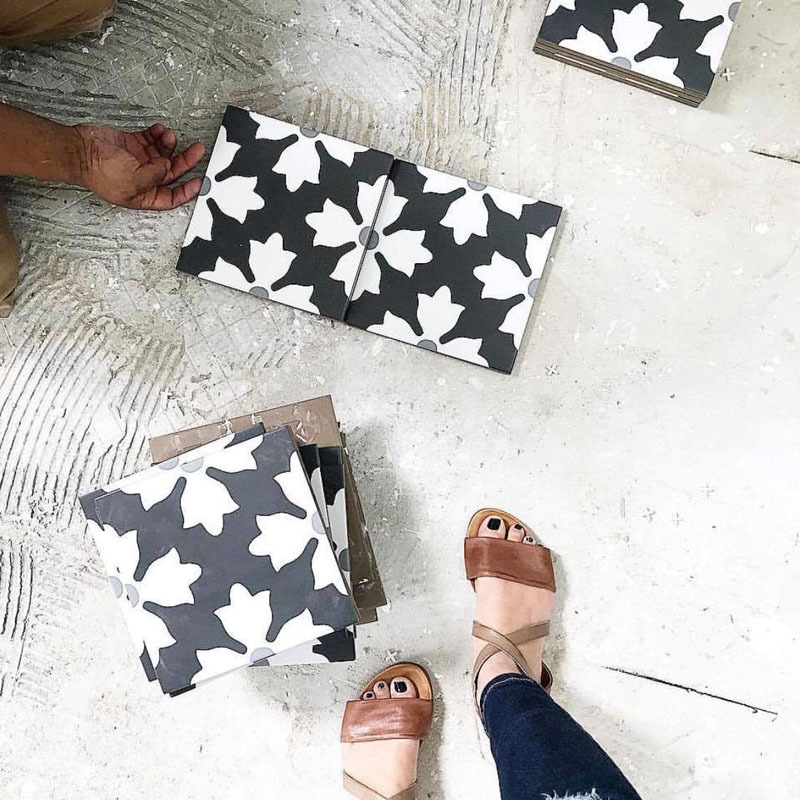 With hectic work weeks, Melissa insists on low-maintenance materials: “Surfaces that require sealing and constant upkeep are just not going to work for us. 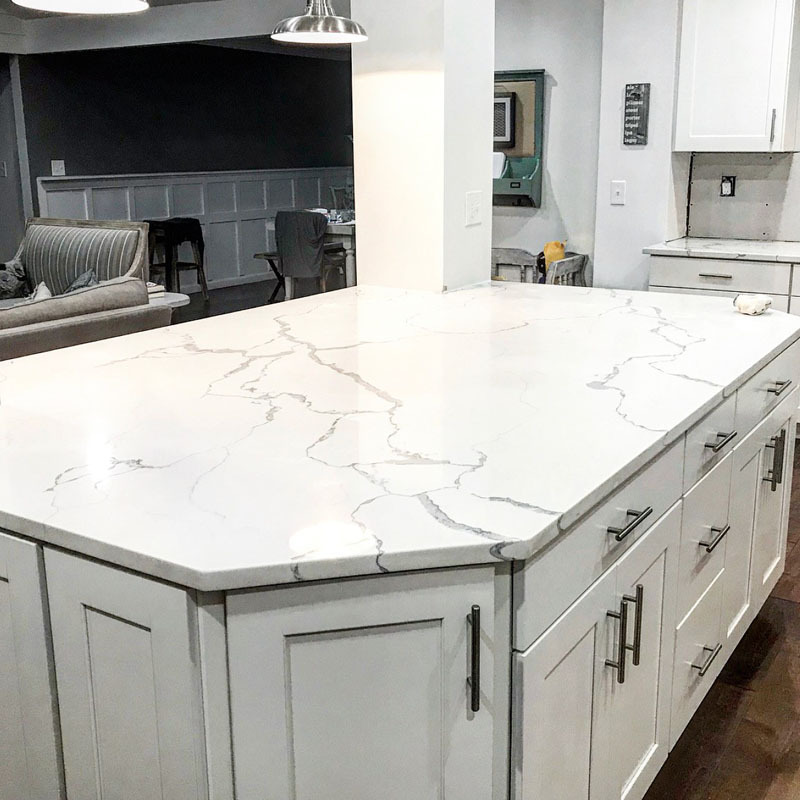 It’s one of the reasons we keep coming back to MSI.” With so many gorgeous and budget-friendly surfaces designed for busy families like the Rennos, we’re not too surprised that our worry-free collections were a perfect fit. Laying down Kenzzi Kasbah on installation day. Just days after the family moved in, a heavy rainstorm caused significant flooding in the home. 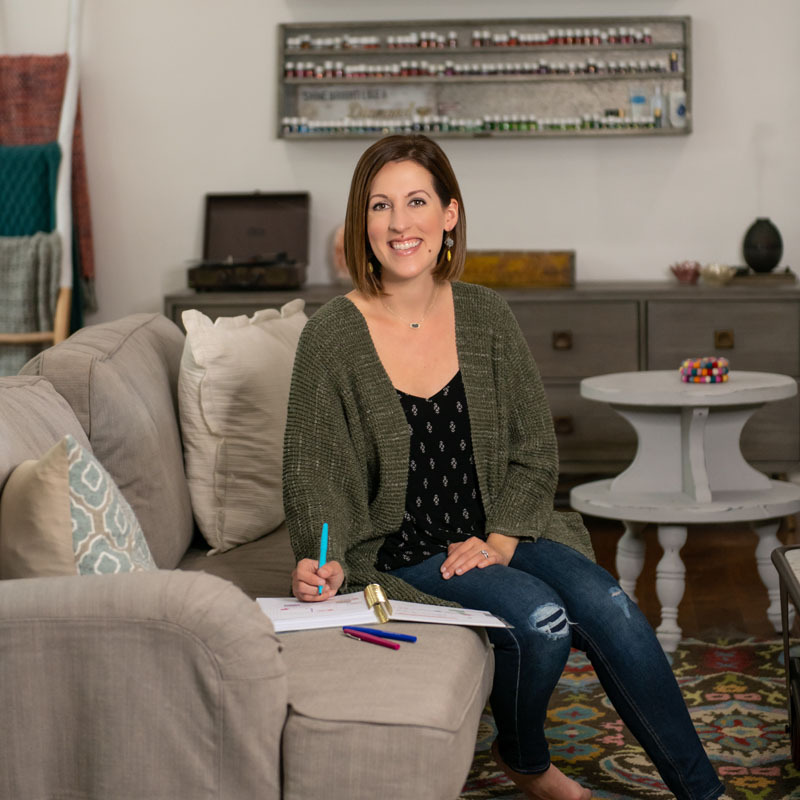 What started as an expensive bit of bad luck, quickly became an opportunity for Melissa to make the space her own: “When it comes to design projects, I’m in my happy place. 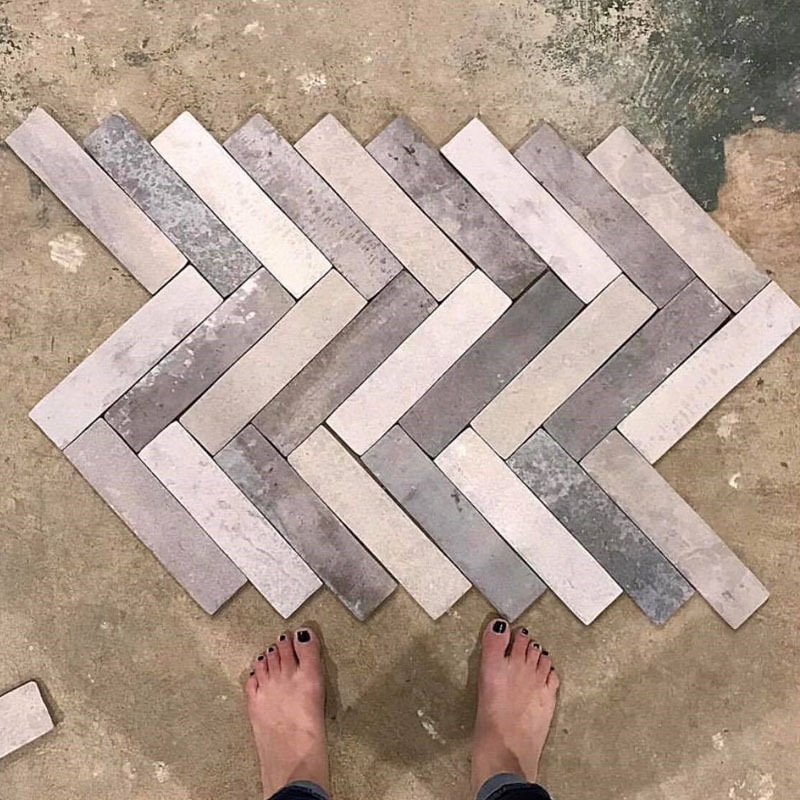 The bones of the house are amazing, but the finishes and floors are cookie-cutter.” After the initial shock of the damage set in, she wasted no time scanning Pinterest, Insta, and her local tile shop for inspiration. Kenzzi Azila tile brightens up the floor in the kid’s bath. “I know aesthetics aren’t important to some people, but I thrive in a beautiful environment. When I first saw Kenzzi, I made a beeline for the display and brought home samples of Kenzzi Azila and Kenzzi Kasbah to try in our bathrooms. I’ve seen similar looks for four times the price, so it was just a matter of getting a feel for how they fit within the room’s existing elements. My instincts were spot on. I love the way it turned out!” Melissa said. After sharing the finished projects on social, Melissa received many requests for design help. Um, we think her hands are full people! Along with the kid’s activities, church, and full social life, her mad sales skills keep her at the tippy-top of the company ladder. 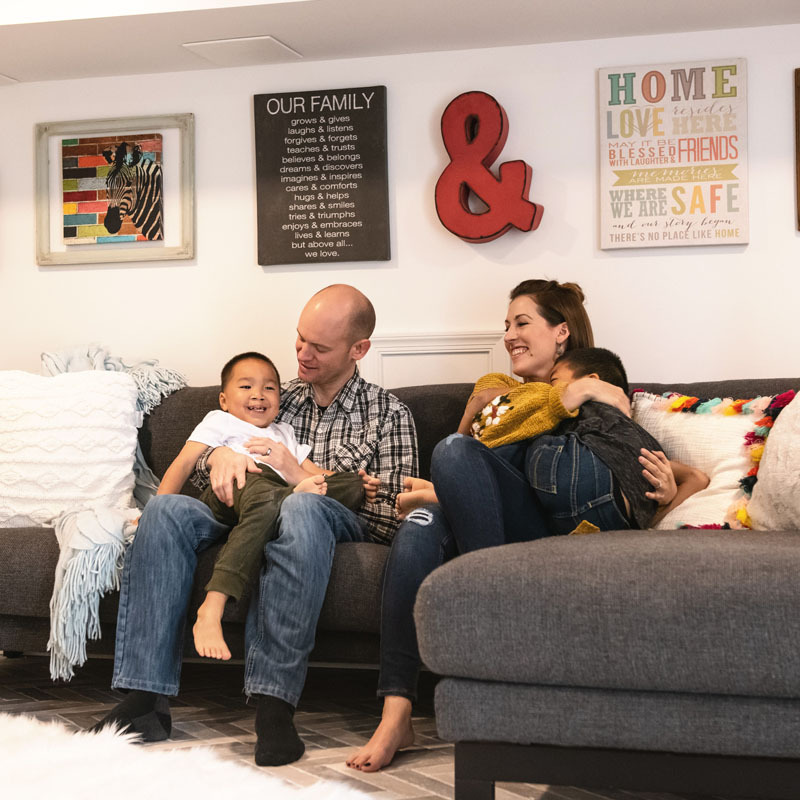 The Rennos enjoy downtime in their new family room. Alternating Brickstone’s Taupe and Ivory tile, Melissa gets a preview of the pattern (um, lesson learned!). 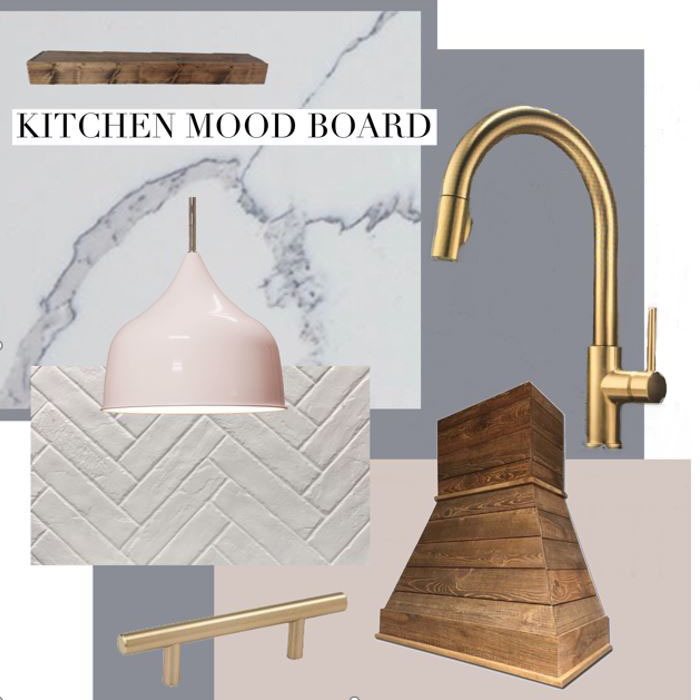 When in doubt, Melissa’s mood board made design decisions a breeze. Melissa and Ryan make Paleo meals together, so they’re excited to start cooking in their new kitchen. At her twin sister’s urging, Melissa opted for the dramatic veins of Q’s Statuary Classique quartz– a departure from her neutral-for-the-big-stuff philosophy. After meeting the truck in the driveway, her second-guessing was over. The slab’s dark blue and gray movement looked stunning. Inside, it was the perfect juxtaposition to the mostly-white palette. 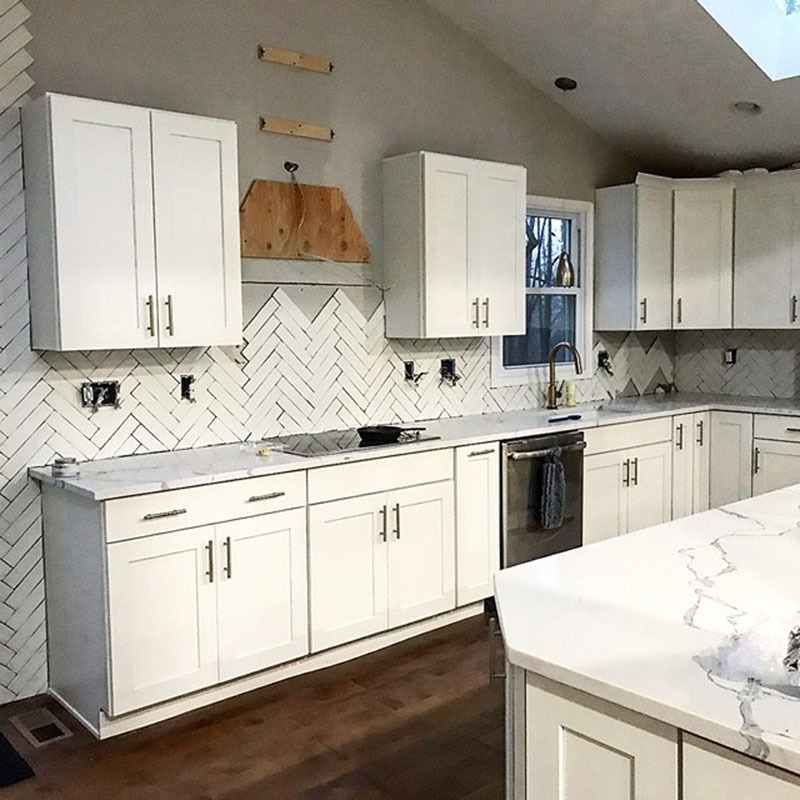 Because the herringbone/Brickstone combo came out like a dream in the family room, she used it again on her backsplash – this time in White. With the first phase of their remodel complete, the Rennos have their sights on a few more home projects. 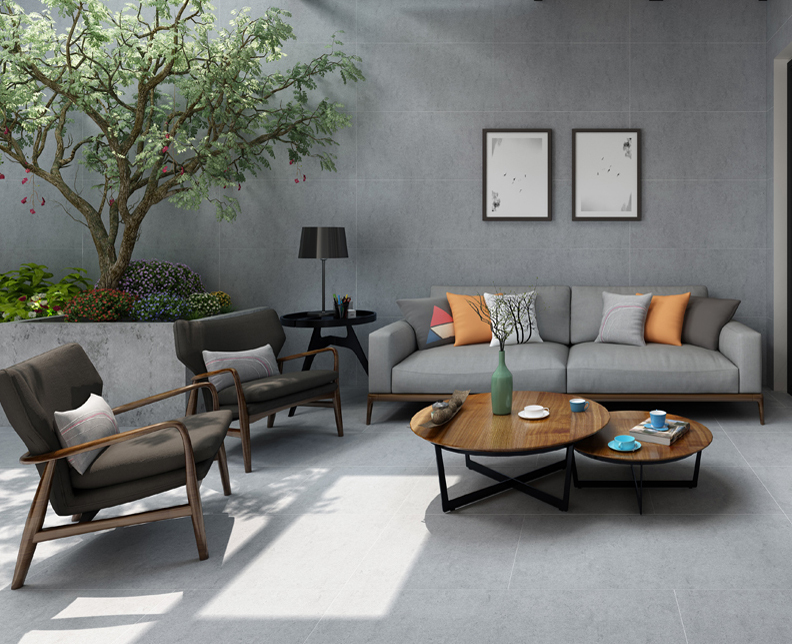 “We have big dreams for our home, and one of them is transforming our back deck into a four-season room where we can hang out, entertain, and appreciate nature,” Melissa said. The plan includes a wood burning fireplace (she’s imagining Kenzzi’s Tamensa), floor-to-ceiling windows, and lots of comfy furniture. 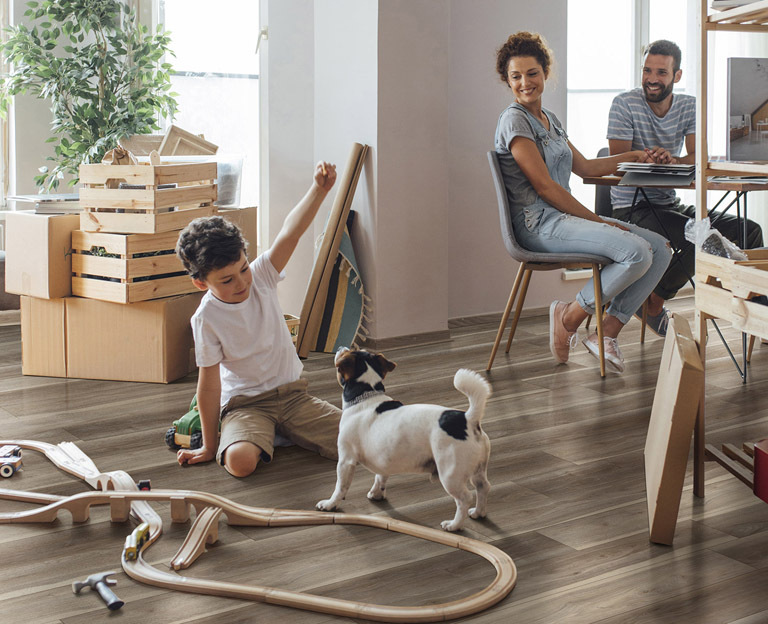 On the floor, eco-friendly 100% Waterproof Everlife LVT is a top contender. 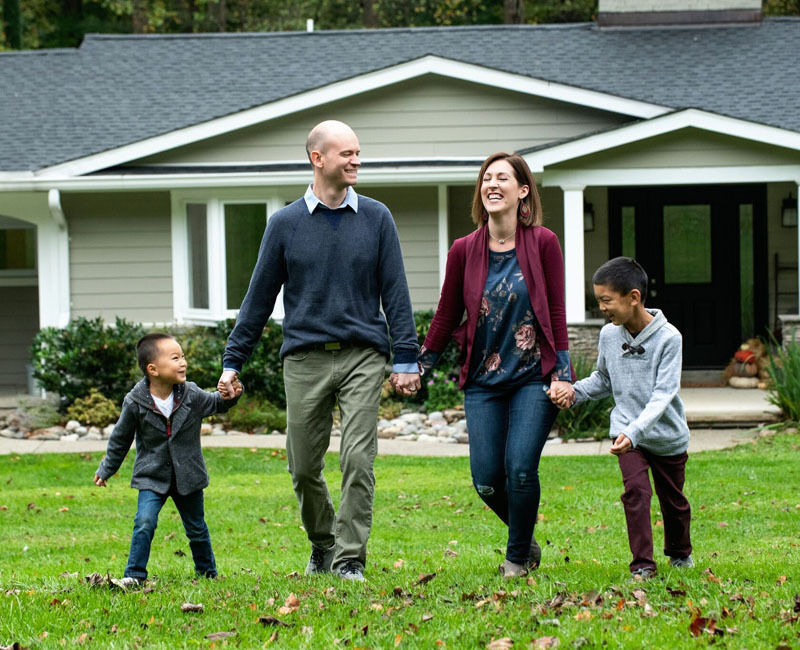 Whether you’re looking to increase the property value of your home before it hits the market, or you’re like the Rennos who just bought a house and can’t wait to make it their own, Melissa’s remodeling tips may come in handy. 1. Get your kids involved: Although my younger son, Bishop, is only six, he has a keen eye for design. As my shopping sidekick, he helped me pick out the Q countertops. Gideon’s more interested in construction, so when possible (and safe! ), he’s learning on the sidelines. 2. Look for inspiration everywhere. 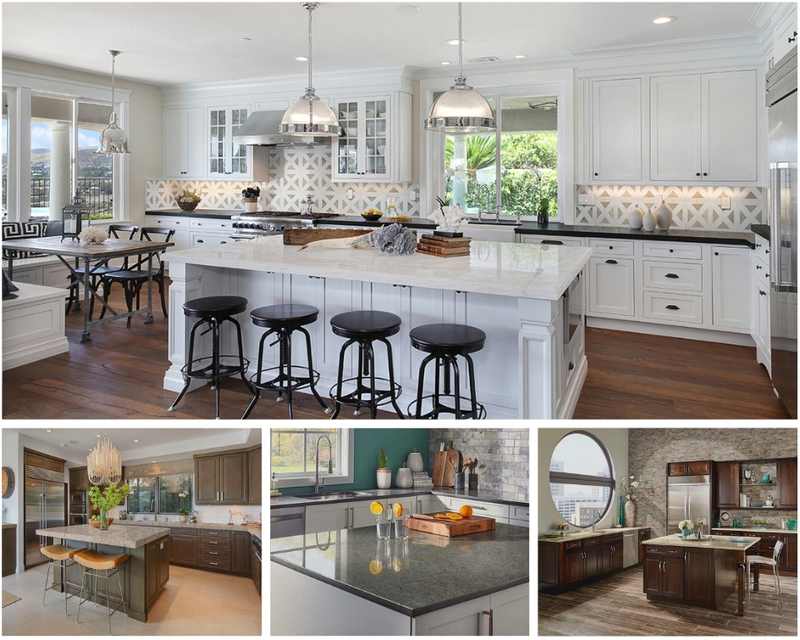 Binge-scrolling through Houzz is fun, but why stop there? 3. The next time you’re out for a walk, at your favorite coffee shop, or just people watching, notice what catches your eye. 4. While I love shopping, I’m also a fan of repurposing. Over the kitchen island, we spray painted the pendants a champagne bronze to match the ridiculously expensive hardware pulls we chose. We couldn’t find lighting we liked more, so it was a win-win all around. 5. Choose pieces you love – you’ll eventually find a place for it. I bought a chandelier a while ago that I couldn’t leave at the store. I’m happy I kept it because it looks fabulous in our new master bath. 6. Stretch outside your comfort zone, on at least one thing. The feeling you have when you take a risk and love it? Nothing like it. Besides, there’s not a lot of growth happening when we continue to do the same thing. 8. Don’t underestimate kindness: I went to a few places before I found MSI’s Jessup store. From the first time I walked in, to a recent visit with my husband, they made me feel at home (they also remembered my name and the slab I wanted, so they get serious bonus points!). Nothing compares to working with people who have integrity. 9. See the entire slab. We have 130 square feet of countertop in our kitchen, so it was invaluable to get a good look at the full slab before making a decision. 10. Don’t settle or scrimp on materials. You’ll regret it – almost instantly.